The newest products to help you cook your meals, clean your home and clear your clutter are getting their annual audition at this year's International Home and Housewares Trade Show at McCormick Place in Chicago. This trade event is the ultimate showcase of home gadgets, where retail buyers from your favorite stores scrutinize the newest product offerings promising to deliver a better cup of coffee, cleaner carpets and the quintessential kitchen widget. Beststuff.com's Senior Editor David Gregg, is in Chicago and provided The Early Show with a sneak peek at some show stoppers! 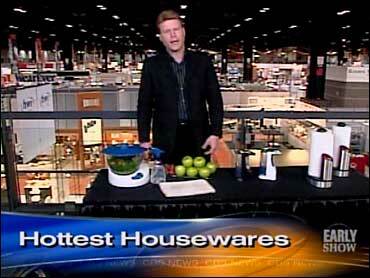 "The International Home and Housewares Show is a little different this year, they have a very strong theme," Gregg told The Early Show co-anchor Harry Smith. "It's not about practical, it's not about functional, it's about putting it all together with cool design."